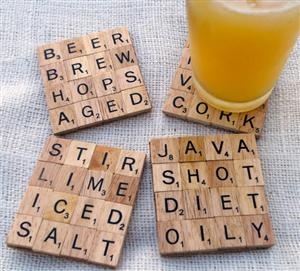 Scrabble coasters are a fun and simple DIY weekend project to get ready for the summer. Great for entertaining, these coasters will always have your guests talking. Get creative with the words as you only have four letters! Measure the size of 4 letters by 4 letters and cut a piece of heavy card stock. Glue the scrabble letters down and wait an hour to dry. Then, cut a piece of felt to go on the bottom to protect any surface you wish to place the coasters on.